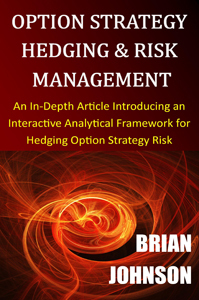 "Option Strategy Hedging & Risk Management: An In-Depth Article Introducing an Interactive Analytical Framework for Hedging Option Strategy Risk" is the #1 New Options Release on Amazon. The Kindle ($9.99) and Print ($14.99) versions are both available. If you enjoy the article, please take a few minutes to provide a brief review on Amazon. It would be greatly appreciated. Thank you for your support. This entry was posted in Options, Recommended Reading, Risk Management and tagged Brian Johnson, futures, Hedging, option strategy, Option Strategy Hedging & Risk Management, options, risk management. Bookmark the permalink.